The Creative Writing Capstone Class would like to invite you to HaggleFest: An Evening of Immersive Reading. The event, which will feature the writing of graduating students in the Creative Writing Concentration, will take place on Thursday, April 21 at 7:00 p.m. at Rodrigue's Coffee House at Fordham's Rose Hill Campus. For more information about the event, stay up to date with the Capstone Class on Twitter. On Friday April 15, Claudia Rankine will read from her award-winning book, Citizen: An American Lyric, at the 2016 Reid Family Writers of Color Reading Series. 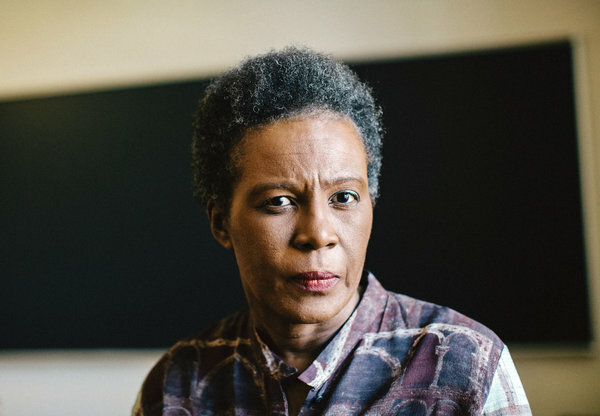 Claudia Rankine is the author of five collections of poetry including Citizen: An American Lyricand Don’t Let Me Be Lonely; two plays including Provenance of Beauty: A South Bronx Travelogue; numerous video collaborations, and is the editor of several anthologies includingThe Racial Imaginary: Writers on Race in the Life of the Mind. For Citizen, Rankine won the Forward Prize for Poetry, the National Book Critics Circle Award for Poetry (Citizen was also nominated in the criticism category, making it the first book in the award’s history to be a double nominee), the Los Angeles Times Book Award, the PEN Open Book Award, and the NAACP Image Award. A finalist for the National Book Award, Citizen also holds the distinction of being the only poetry book to be a New York Times bestseller in the nonfiction category. Among her numerous awards and honors, Rankine is the recipient of the Poets & Writers’ Jackson Poetry Prize and fellowships from the Lannan Foundation and the National Endowment of the Arts. She lives in California and is the Aerol Arnold Chair in the University of Southern California English Department. On Tuesday, January 26, the Creative Writing program will feature Carl Hancock Rux at the Spring Semester Prose Reading. The event will take place at 7 p.m. in Lincoln Center's 12th Floor Lounge. Carl Hancock Rux is an award-winning poet, playwright, novelist, essayist and recording artist. He is the former head of the MFA Writing for Performance Program at the California Institute of the Arts (2006-09) and has taught or been in residence at the University of California–San Diego, Stanford University, the University of Massachusetts Amherst, Hollins University, the University of Iowa and Brown University. Rux is also the author of the novel, Asphalt, the OBIE Award winning play, Talk, and the Village Voice Literary prize-winning collection of poetry, Pagan Operetta. On Thursday, October 15, writers, academics, students, and fans gathered to celebrate the 25th anniversary of Jessica Hagedorn's groundbreaking Filipino American novel, Dogeaters. Fordham Law School's Bateman Room was standing room only for the writers' and artists' roundtable moderated by playwright, novelist, and MacArthur Fellowship recipient, Han Ong. The passionate panelists included Mia Alvar, Gina Apostol, Nerissa Balce, Mia Katigbak, Walter Mosley, Ralph Peña, Allan Punzalan Isaac, Jeffrey Santa Ana, and the author herself, Jessica Hagedorn. Nerissa Balce, an associate professor of Asian American studies at SUNY Stony Brook, opened the roundtable discussion with a reading from the last chapter of Dogeaters, "Kundiman." In her discussion on the prayer-turned-curse, Balce noted, "This novel captures the very complex relationships people have with the Philippines." She quoted a line from "Kundiman" to reinforce her point: "Manila I was born here, Manila I will die here, tantum ergo sacramentum." Ong asked panelists to recount their first experience with Dogeaters. "At first I couldn't get through it," said Alan Punzalan Isaac, a chair of American Studies and associate professor of American Studies and English at Rutgers University. "But, then I realized I could read the book like poetry." Mia Alvar, a fiction writer, also sought a piece of her identity the first time she picked up Dogeaters. "It's hard to overstate how absent my own face or the faces of my family were from the novels I was reading [as a young adult]." Assuming that Dogeaters would be a "warm and fuzzy book about [her] home country," Alvar admitted that she was "extremely unsettled and destabilized" by the experience of reading Dogeaters. "It was the first time I asked myself if books and art were around to make me feel comfortable." Mia Katigbak described her first encounter with the novel as "a kind of surge of memories I didn't know I had anymore." Ralph Peña, a playwright, compared his first reading of Dogeaters to having an interior designer completely redesign the home in which he grew up. It gave him the impression that he too could be an artist in the United States: "It was life affirming." Balce hailed Dogeaters as the type of novel she had been waiting for in her study of Asian American culture, saying, "It was a book I could claim. Asian American literature doesn't always have to be about the American experience. Living through the trauma of being Filipino: that's what I want to read." Praise for Dogeaters continued as Ong asked the panelists to locate the novel in conversations in literature. Acclaimed American writer, Walter Mosley placed Dogeaters in the literary tradition of Nikolai Gogol's Dead Souls, Fyodor Dostoyevsky's The Idiot, and the works of Gabriel García Márquez. "[Dogeaters] is not limited by culture, or by race, or by gender. You can understand it in China. You can understand it in Russia. You can understand it in Haight-Ashbury," said Mosley. Isaac elaborated on the universality of Dogeaters, quoting a former student: "The brokenness of the novel makes sense if you know what it's like to be colonized." The panelists nodded in agreement. Unsurprisingly, one of the highlights of the event came when Hagedorn herself joined in on the conversation. As the panelists discussed the categorization of Dogeaters as "the book that gave Filipino Americans a mirror," Hagedorn admitted that she had always found it "bizarre" that people referred to it as a Filipino American novel. When asked what she would call it instead, Hagedorn replied, "A global novel." Fordham is grateful to the Asian/Pacific/American Institute at New York University for their co-sponsorship of this event. "The Long Game: Building Your Life as a Writer & Editor"
There are many ways to be a writer. You can write twenty articles a day for a website, your pay, if any, determined by the number of clicks they get. You can come home from an office job and chip away at a novel. You can sell poems to literary journals. You can advertise or publicize. You can help shape somebody else’s work into the best that it can be. No matter what you do, to succeed in the writing life, you have to work. Since the audience was made up mostly of undergraduates, much of the discussion focused not only on craft, but on MFA programs and career potential. “It’s important to ask yourself,” Gambito said, “if an MFA is right for you.” Are you looking to accelerate your progress, hone your critical skills, or gain a community? Are you passionate about teaching? All of these are good reasons to get an MFA. If you’re looking to make connections and/or get a book deal, you’ll probably be disappointed. The speakers agreed that you shouldn’t go into debt for an MFA. “Find one that will pay you,” they said, citing the University of Michigan’s program as an example. Santora provided a crash course on professionalism and the interview process. Employers expect two internships before you graduate. Keep your resume to one page. Go out of your way to research your field and ask intelligent questions. Have a working knowledge of Adobe suite. “Don’t list email as a skill,” Santora said. “It’s 2015. Email is a given.” Personal touches, like sending a handwritten thank you note to a potential employer, make a big difference. Self-awareness is essential to building a successful career. As Santora explained, there are many different fields out there for a writer / editor. It’s important to first know who you are and how you work. Are you a better fit for journalism or advertising? Full-time or freelance? Know yourself and that will help you know what’s right for you. Fordham University's Creative Writing Program cordially invites you to celebrate the winners of the 2015 Creative Writing Prizes. Anna Marie Anastasi, "3 Secrets"
Rachel Federman, "The Parts I Don't Believe"
Mary Kate Crenny, "His Eyes Won't Be Blue"
Wallis Monday, "Lonesome Years in the West"
Frank Sivilli, "South of the House"